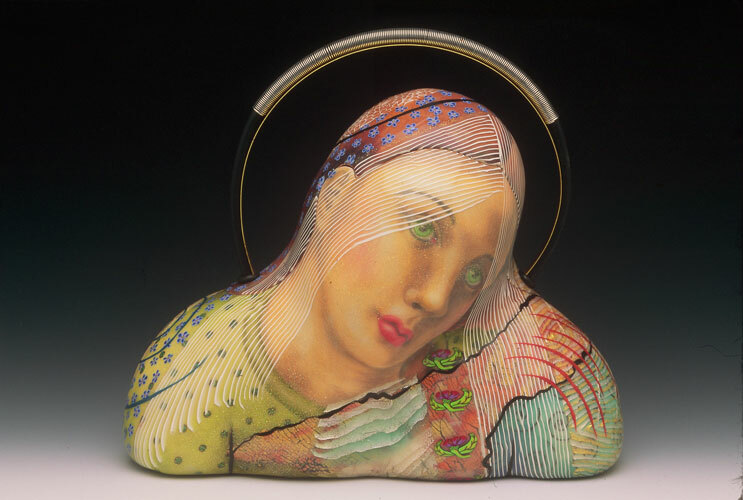 It was a material “whose time had come,” and it was Kathleen who put it in front of the world when she wrote the first published article on polymer clay for Ornament Magazine in 1987. The article, titled “The Use of Polyform in Bead Making,” brought Steven Ford and David Forlano knocking at her Torpedo Factory studio door. She also met Tory Hughes, among other artists who were previously working alone and unaware of each other (this was before the internet). It was Pier Voulkos though, who Kathleen credits for being the first to really do much with polymer clay beads or the millefiori technique, and who really turned her on to the artistic potential of the clay. Kathleen’s mastery of her craft amplifies her artistic voice, which rings clear with a keen appreciation for the depth of the human experience as well as the beauty of nature. 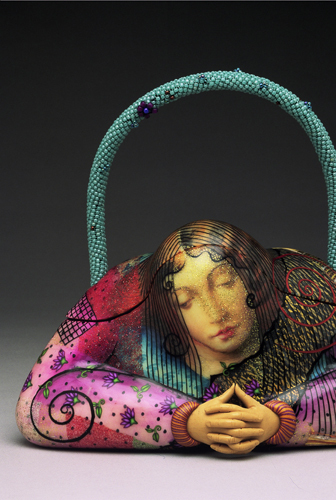 Clearly not one to rest on her laurels, she has resisted the temptation to stick with the winning formula she found with the series of beads and purses she created which feature the figures and faces of women of the world. They range from village woman wrapped in layers of lush fabrics, to complex emotional portraiture, all lovingly treated with a bevy of patterning techniques. Combining Skinner blends, (gradient blends) millefiori canework, hand drawn image transfers, translucent clay, and much more, this work demonstrates her technical dexterity and compositional skill, weaving all into a lush and inviting visual tapestry. 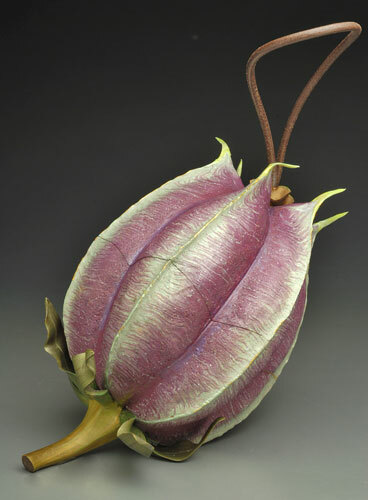 The latest work to find its way out of Kathleen’s rigorous development process is influenced by botanical forms. Her “Woodlands” and “Pod” series represent a departure for Dustin, who is admittedly reticent to explore her natural world influences, lest the results seem “trite.” She escapes that pitfall with grace, creating convincing naturalistic pieces with all the contemporary flair of her “Classic” and “Modern” series. While Kathleen finds great satisfaction in her artistic process, which she describes as “daydreaming” she emphasizes that is also “plain old work.” It takes perseverance and focus. Dustin, trained as a mathematician, is by nature a problem solver. She does not sit down to play with the clay so much as to solve specific design problems, to which she gives much focused thought. “You are more creative when you have limits than you are when the world is open,” says Dustin, who advises that aspiring artists and craftspeople choose a medium and stick with it for a few years. 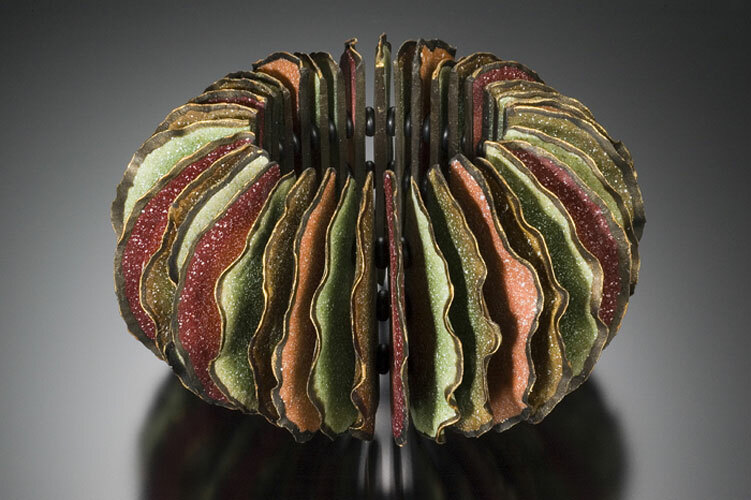 After 28 years as a professional craftsperson, Kathleen says she is becoming more interested in mixed media. That will likely be a gradual process for Dustin, for whom form follows function, and creation follows idea. Over the years we have been treated to an artistic journey, as her transforming work mirrors the transformation in her life. Here’s to 28 more years of beauty in both. Thanks Kathleen for all your great work and for being part of my book. Thanks to Craftcast for all of the quotes and much of the information in this article. Listen to Alison Lee interview of Kathleen here. 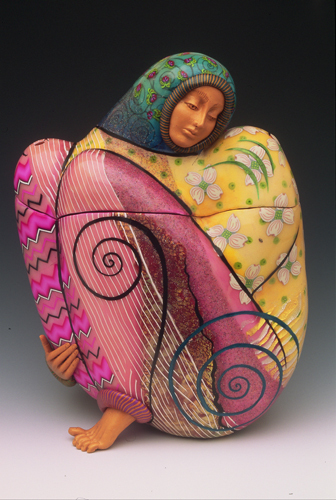 You can check out archived interviews of polymer clay artists here, including other “Polymer Clay Beads” artists Celie Fago and Elise Winters. The next step for the advancement of polymer clay as a significant medium is for museum quality work to be recognized as such, and Kathleen is right on top of that. 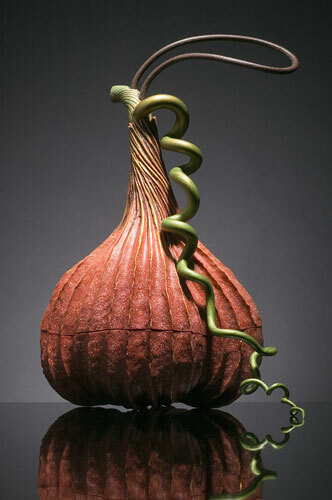 She has been chosen by the Fuller Craft Museum near Boston to curate a show focusing on polymer as a sculptural medium, due to run from August to November, 2009. I believe that this will be the second museum show to focus on polymer, the first being that held at the Kentucky Museum of Art and Design, which took place in March and April of 2004, and in which I was honored to be invited to participate. The upcoming show will be focused more exclusively on sculptural polymer installations and promises to be groundbreaking. 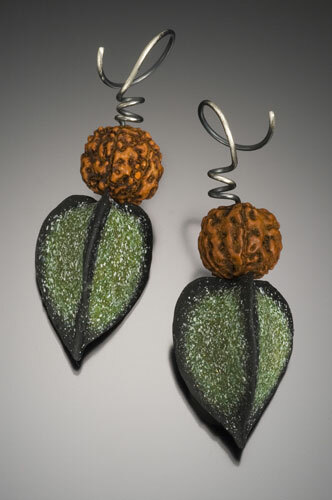 You can see more of Kathleen Dustin’s work on her website and track her latest information on her blog. She has also been writing for Elise Winter’s excellent Polymer Art Archive.